Sula is Europe's No.1 sugar-free sweet producer. Founded in 1950, Sulá started producing sugar-free sweets in 1970, giving them now almost 40 years experience. As a result of the high quality and efficient Sula production they now produce 70% of Europe's hard sugar-free sweets. Sula products not only have a great taste but they also use new natural ingredients that are free from artificial flavours, artificial colours, hydrogenated fats, aspartame, acesulfame and preservatives. 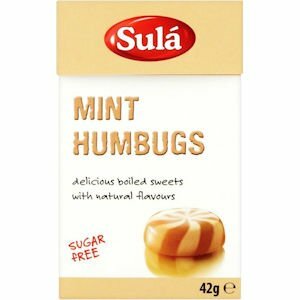 Sula Boiled Sweets come in a range of flavours to appeal to all tastes. Sweets are available in a handy flip-top box for eating on-the-go. No directions are listed for this product. Sweeteners (Isomalt, Sucralose), Cream (6,9%), Butter, Salt, Emulsifier (Soya Lecithin), Colour (Titanium Dioxide), Natural Peppermint Flavouring, Caramel, Natural Vanilla Flavouring with other natural flavours.